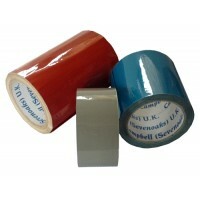 Colour All Weather Pipe ID Tape- Campbell International Specialist Tapes. Please note RAL colours may vary slightly to British Standard colours. We can supply to any Standard including, but not limited to: BS 381C:1964, BS 4800:1972, RAL, BS 1710:1984, BS 1710:2014, ISO 14726, BS Supplementary Information. 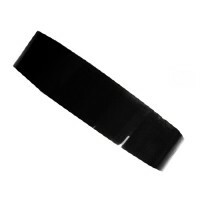 If you require a pipe identification tape which is not listed on this website then it may be a colour/size/print we do not currently stock. Note a £36 origination is applicable here. Simply select a size (indoor or all weather), a base colour and optionally any text you wish printed on the ta.. Size: 50mm x 23m Colour: Aquamarine - BS:16E53 / RAL6016 Technical Specification: White Polyester laminated with Linerless Transparent Polyester Excellent UV Protection. Resists most common oils, aliphatic solvents such as Heptan, Kerosene and alcohols when applied to impervious substrates. S.. Size: 150mm x 23m	Colour: AUXILLARY BLUE 18E53	Technical Specification: White Polyester laminated with Linerless Transparent Polyester Excellent UV Protection. Resists most common oils, aliphatic solvents such as Heptan, Kerosene and alcohols when applied to impervious substrates. Suitable for use .. Size: 50mm x 23m	Colour: AUXILLARY BLUE 18E53	Technical Specification: White Polyester laminated with Linerless Transparent Polyester Excellent UV Protection. Resists most common oils, aliphatic solvents such as Heptan, Kerosene and alcohols when applied to impervious substrates. Suitable for use o.. 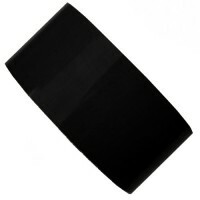 Size: 150mm x 23m	Colour: BLACK 00E53	Technical Specification: White Polyester laminated with Linerless Transparent Polyester Excellent UV Protection. Resists most common oils, aliphatic solvents such as Heptan, Kerosene and alcohols when applied to impervious substrates. Suitable for use on all pi.. Size: 50mm x 23m	Colour: Black 00E53	Technical Specification: White Polyester laminated with Linerless Transparent Polyester Excellent UV Protection. Resists most common oils, aliphatic solvents such as Heptan, Kerosene and alcohols when applied to impervious substrates. Suitable for use on all pip.. 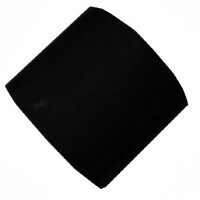 Size: 50mm x 30m	Colour: Black 00E53	Technical Specification: White Polyester laminated with Linerless Transparent Polyester Excellent UV Protection. Resists most common oils, aliphatic solvents such as Heptan, Kerosene and alcohols when applied to impervious substrates. Suitable for use on all pip.. Size: 150mm x 23m	Colour: Brown - 06C39	Technical Specification: White Polyester laminated with Linerless Transparent Polyester Excellent UV Protection. Resists most common oils, aliphatic solvents such as Heptan, Kerosene and alcohols when applied to impervious substrates. Suitable for use on all .. Size: 50mm x 23m	Colour: Brown - 06C39 / RAL 8007	Technical Specification: White Polyester laminated with Linerless Transparent Polyester Excellent UV Protection. Resists most common oils, aliphatic solvents such as Heptan, Kerosene and alcohols when applied to impervious substrates. Suitable for u.. Size: 50mm x 23m Colour: Corvette Blue - 18C35 Technical Specification: White Polyester laminated with Linerless Transparent Polyester Excellent UV Protection. Resists most common oils, aliphatic solvents such as Heptan, Kerosene and alcohols when applied to impervious substrates. Suitable fo.. Size: 50mm x 23m Colour: Crimson 04D45 Technical Specification: White Polyester laminated with Linerless Transparent Polyester Excellent UV Protection. Resists most common oils, aliphatic solvents such as Heptan, Kerosene and alcohols when applied to impervious substrates. Suitable for use on.. Size: 50mm x 23m	Colour: Deep Chrome Green RAL 267 or (Replaced or undistinguishable) Light Moss Green RAL 6005	Technical Specification: White Polyester laminated with Linerless Transparent Polyester Excellent UV Protection. Resists most common oils, aliphatic solvents such as Heptan, Kerosene and .. Size: 50mm x 23m Colour: Delphinium Blue - 18E51 Technical Specification: White Polyester laminated with Linerless Transparent Polyester Excellent UV Protection. Resists most common oils, aliphatic solvents such as Heptan, Kerosene and alcohols when applied to impervious substrates. Suitable .. Size: 50mm x 23m Colour: Dutchess Blue BS:20C40 / RAL5007 Technical Specification: White Polyester laminated with Linerless Transparent Polyester Excellent UV Protection. Resists most common oils, aliphatic solvents such as Heptan, Kerosene and alcohols when applied to impervious substrates. .. Size: 50mm x 23m Colour: Eay-De-Nil - 216 Technical Specification: White Polyester laminated with Linerless Transparent Polyester Excellent UV Protection. Resists most common oils, aliphatic solvents such as Heptan, Kerosene and alcohols when applied to impervious substrates. Suitable for use.. Size: 150mm	Colour: Emerald Green 14E53	Technical Specification: White Polyester laminated with Linerless Transparent Polyester Excellent UV Protection. Resists most common oils, aliphatic solvents such as Heptan, Kerosene and alcohols when applied to impervious substrates. Suitable for use on.. Size: 50mm x 23m	Colour: Emerald Green 14E53	Technical Specification: White Polyester laminated with Linerless Transparent Polyester Excellent UV Protection. Resists most common oils, aliphatic solvents such as Heptan, Kerosene and alcohols when applied to impervious substrates. Suitable for use on.. Size: 50mm x 23m	Colour: Golden Brown RAL 8001 /PMS 873C	Technical Specification: White Polyester laminated with Linerless Transparent Polyester Excellent UV Protection. Resists most common oils, aliphatic solvents such as Heptan, Kerosene and alcohols when applied to impervious substrates. Suitabl.. Size: 150mm x 23m	Colour: GOLDEN BROWN 06D45	Technical Specification: White Polyester laminated with Linerless Transparent Polyester Excellent UV Protection. Resists most common oils, aliphatic solvents such as Heptan, Kerosene and alcohols when applied to impervious substrates. Suitable for use on.. Size: 50mm x 23m	Colour: Golden Brown / Tan - 06D45	Technical Specification: White Polyester laminated with Linerless Transparent Polyester Excellent UV Protection. Resists most common oils, aliphatic solvents such as Heptan, Kerosene and alcohols when applied to impervious substrates. Suitabl.. Size: 25mm x 23m Colour: Golden Yellow 08E51 Technical Specification: White Polyester laminated with Linerless Transparent Polyester Excellent UV Protection. Resists most common oils, aliphatic solvents such as Heptan, Kerosene and alcohols when applied to impervious substrates. Suitable for .. Size: 50mm x 23m Colour: Green Haze - 12C33 Technical Specification: White Polyester laminated with Linerless Transparent Polyester Excellent UV Protection. Resists most common oils, aliphatic solvents such as Heptan, Kerosene and alcohols when applied to impervious substrates. Suitable for u.. 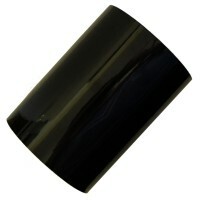 Heavy Duty PVC Pipe Wrap Insulation Tape coated with an anti-corrosive aggressive adhesive. Size: 48mm x 33m	Colour: Black	Thickness: 0.25mm	Tensile Strength at Break: 44N/cm	Elongation at Break: 200%	Adhesion to Steel: 2.4 N/10mm	Adhesion to Self: 2.4 N/10mm	Dielectric Strength: 1250 Volts/Mil	M.. Size: 50mm x 23m Colour: Larkspur Blue 20C37 Technical Specification: White Polyester laminated with Linerless Transparent Polyester Excellent UV Protection. Resists most common oils, aliphatic solvents such as Heptan, Kerosene and alcohols when applied to impervious substrates. Suitable for .. Size: 50mm x 23m Colour: Leather Brown 06C37 Technical Specification: White Polyester laminated with Linerless Transparent Polyester Excellent UV Protection. Resists most common oils, aliphatic solvents such as Heptan, Kerosene and alcohols when applied to impervious substrates. Suitable for .. Size: 50mm x 23m	Colour: Light Blue 20E51	Technical Specification: White Polyester laminated with Linerless Transparent Polyester Excellent UV Protection. Resists most common oils, aliphatic solvents such as Heptan, Kerosene and alcohols when applied to impervious substrates. Suitable for use on al.. Size: 50mm x 30m	Colour: Light Blue 20E51	Technical Specification: White Polyester laminated with Linerless Transparent Polyester Excellent UV Protection. Resists most common oils, aliphatic solvents such as Heptan, Kerosene and alcohols when applied to impervious substrates. Suitable for use on al.. Size: 100mm x 23m	Colour: Linden Green - 12E53	Technical Specification: White Polyester laminated with Linerless Transparent Polyester Excellent UV Protection. Resists most common oils, aliphatic solvents such as Heptan, Kerosene and alcohols when applied to impervious substrates. Suitable for.. Size: 150mm x 23m	Colour: Linden Green - 12E53	Technical Specification: White Polyester laminated with Linerless Transparent Polyester Excellent UV Protection. Resists most common oils, aliphatic solvents such as Heptan, Kerosene and alcohols when applied to impervious substrates. Suitable for.. Size: 50mm x 23m	Colour: Linden Green - 12E53	Technical Specification: White Polyester laminated with Linerless Transparent Polyester Excellent UV Protection. Resists most common oils, aliphatic solvents such as Heptan, Kerosene and alcohols when applied to impervious substrates. Suitable for use o..